We create the rating using a model that considers information the lawyer has included on their profile in addition to the information we collect from public sources like state bar associations and lawyer websites. Any information that affects the Avvo Rating is visible in an attorney’s profile. 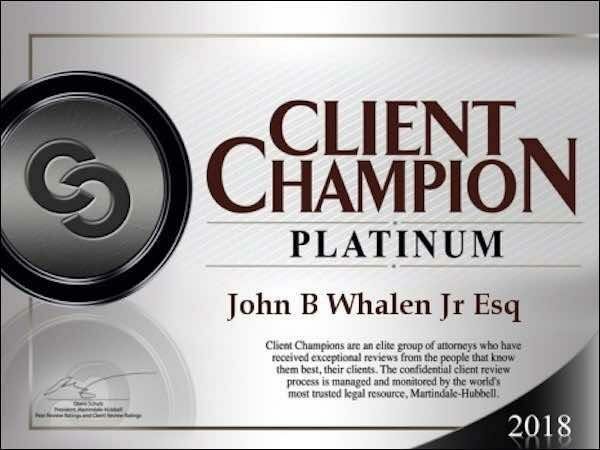 John B. Whalen, Jr., JD., LL.M., is an AV Peer Review Rated Preeminent 5.0 and Avvo Rated 10.0 Superb (obtaining over 95 client reviews and peer endorsements). Mr. Whalen concentratess his three decade career in the legal areas of Pa Probate, Pa Last Wills, Pa Estates, and Pa Estate Settlement. He is AV Peer Review Rated Preeminent and Avvo Rated Superb 10.00.